The appearance of a damp patch on a wall can be worrying but the cause isn’t necessarily rain water getting through the wall or roof. A recent investigation by BRE has highlighted that condensation doesn’t always just form on the windows. While investigating another matter, BRE recently came across a localised patch of dampness on an otherwise unremarkable wall (photo right). The house was built in 2006 and complied with the current Building Regulations, having concrete blockwork inner and outer leafs to the cavity walls and with traditional external render. The cavity was partially filled with insulation. The first floor bedrooms had low eaves with rafter-level insulation across part of the ceiling and a traditionally tiled roof. 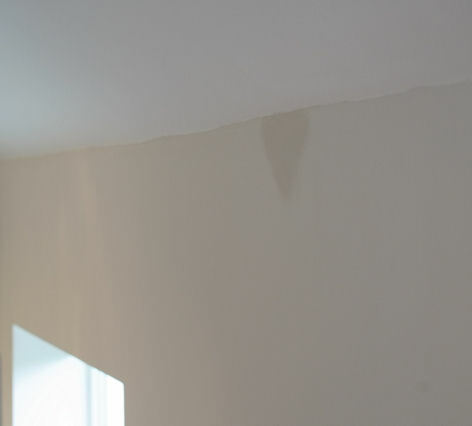 The dampness appeared to have been caused by a leak that had run down within the roof, exiting at the eaves and soaking into the plasterboard. The owners reported that nothing similar had been seen previously. At the time of the apparent leak, the external temperature had dropped overnight after an unusually mild September but the central heating had not been operated since Spring. It was a cool and clear morning and the external temperature was around 8 °C, while the external humidity was 95% RH. Inside the house, the air temperature was around 16 °C and the surface temperature of the walls was 14.5 °C. Within the damp patch, however, the temperature was slightly lower, at 13.5 °C. The critical measurement was the relative humidity in the room. This was found to be approximately 85 % RH at 16 °C. And this meant that the dew point in the room was 13.7 °C, pointing to the cause of the dampness being condensation rather than a leak. Clearly the dampness on the wall in this case was a result of condensation occurring on a cold spot - a so-called thermal bridge - where some feature of the construction allows heat to be conducted from the warmer inner wall to the cooler outer wall. 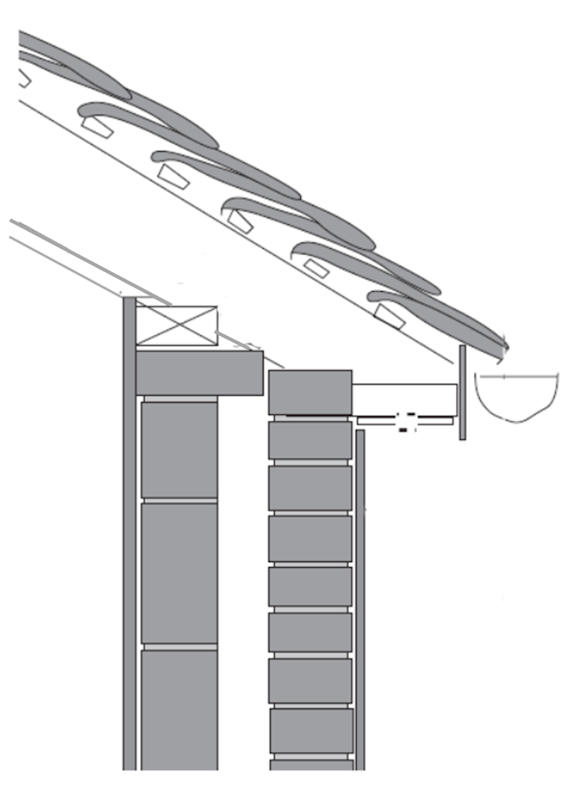 Thermal bridges are normally caused by lintels within walls, window reveals, missing insulation, excess mortar bridging between the inner and outer leaves or other debris within the cavity. Considering the location of this cold spot, just below the eaves, it is likely that there is a small break in the insulation that is present between the rafters. Or that some form of construction debris is sitting on the top of the blockwork walls, bridging between the inner and outer leaves and thereby conducting heat faster than through the cavity insulation (see image right). The dampness dried out within a few hours leaving no marks on the painted walls. Had the dampness persisted for prolonged periods, it is possible that mould could grow on the wall at this position. This would be a risk if the thermal bridge caused a greater drop in surface temperature or if the location was not well ventilated, such as being behind furniture or a picture. A large number of the condensation problems that BRE has investigated in modern housing have been the result of a lack of ventilation, with windows staying shut and trickle vents being closed during the normal family activities of cooking, showering and drying clothes within the house. In order to keep the internal humidity low during these activities, ventilation is required, particularly with the current levels of airtightness that are required by Building Regulations. In this case, the fact that the owners reported never having seen this effect before suggests that the drop in external temperature after a prolonged mild period has highlighted a construction feature that otherwise would not have been noticed. It also suggests that this thermal bridge is no cause for concern and is only likely to become evident in similar climatic conditions with no heating within the house.